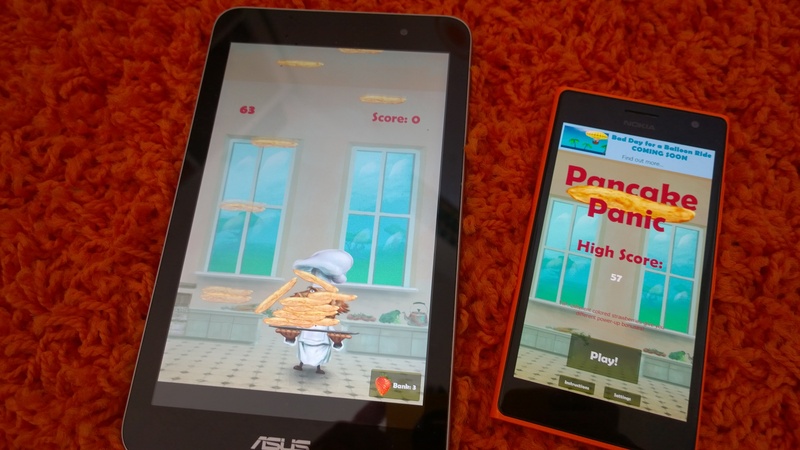 Version 2.2 of Pancake Panic is now rolling out. This update includes improvements to the responsiveness of the game, and the controls. The chef now moves quicker than before. We’ve also added some velocity to his movement, so when you lift your finger up, he slides a little on the kitchen floor, adding even more strategy to the madness. Secondly, we’ve added an instruction page to the game to explain the simple controls. We received feedback that some users were trying to drag the chef, so hopefully this screen will clear up the confusion. You simply touch the left-half of the screen to move left, and the right-half of the screen to move right. Finally, we ran a coding workshop with Springwell Primary School this week, where we improved the Pancake Panic Frenzy mode. This mode, which kicks in when you catch the rainbow strawberry, is even crazier than before, and will allow you to improve your high score. They also suggested a new power-up which we’ll be working on for the next update. The update is rolling out today for Windows, Windows Phone, and Android. Download it using the links below, and we’d love your feedback! Leave us a review, and a rating, or add a comment to this post below.